You might think anything goes when it comes to what goes down the toilet… BUT it really doesn’t! 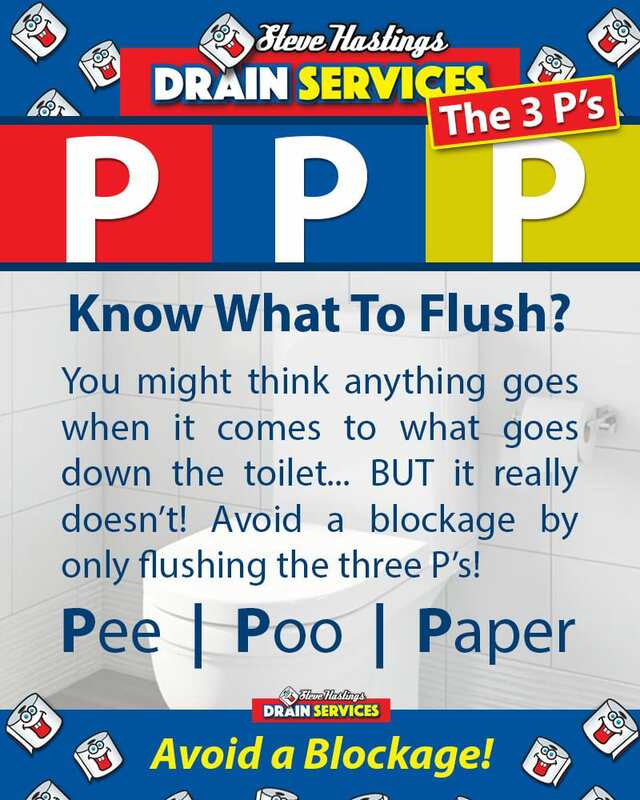 Avoid a blockage by only flushing the three P’s! I’ve used Steve Hastings Drainage a couple of times now on different jobs and found them to be efficient, polite and good value for money. I can definitely recommend them. Credit to the company what a great guy. Was very funny with good humour. He managed to get out to me within two hours of me phoning which i was very happy with. The problem was sorted from start to finish within an hour and a half, and the price was also great !! Very pleased ? Really nice gentleman. He was very friendly on the phone and had a great sense of humour. Rectified my drainage problem and the rate he charged was very reasonable. Very happy customer ? Yes, I read all the bad reviews! But sometimes it is empty vessels that make the most noise... I wanted to write a positive review, since the job was done swiftly and professionally, however I find myself with a couple of niggles... Although they were 45 minutes late in arriving, having said they would be here at 9:30, they were in, done and out within another thirty minutes which I very much appreciated. Yes, it cost £90+VAT and not the "£20 and no hidden extra charges" emblazoned all over the website, but I had already noticed that that was for rodding only. It's a shame because it almost feels like a bait and switch... If I was advising on their marketing, I would suggest that they show the jetting price on their website, too, and state clearly that that is the next price stage should the £20 service not be possible. If a customer has "£20 and no hidden extra charges" fixed in their head (thanks to your website) and you then charge them £108 (90+VAT) then you WILL get some irate customers and a few bad reviews! More transparency would definitely give a better customer experience. I would also suggest that they give a time range for arrival. Had they told me 9:30-10:00, which is much more realistic anyway, then they'd only have been fifteen minutes late rather than forty-five! It's just expectation management... All that said, Chris did a great job, was very personable, polite and professional. I would still recommend this company for their professional service, but I would also advise to take the £20 charge with a pinch of salt and be prepared to pay £108. Very abusive and not very nice person if you do not accept the no obligation free quote. on the plus side, promised would have someone out at 8 am, and that is what he did. There are loads of great reviews on here for you, Im just not happy to have the abuse given to me, just because I had another local lad quote me half your price. Thanks Steve. Called at lunchtime and engineer arrived by 3pm. Great young lad, very courteous and polite. Communicated all options and costs and completed the job very cleanly and quickly. Couldn't be happier of the service offered to my elderly parents and over 75% cheaper than national drain companies quoted. Very happy customer, will use again and recommend to friends and family. Thank you. Fantastic service. Super-fast response, very knowledgeable and understanding. Wouldn't hesitate to recommend to others.